First, invest dollars back into your busi- ness. Most of you, because of the 2017 Tax Cuts and Jobs Act, will save 20 percent or more on your taxes this year, and almost all investments you make in your business to help it grow will be tax deductible in the year you put those investment into use. Why not set aside and use those savings alone to finance the investments you could make to plan for, grow and create the business of your dreams? Do them now though—the same- year deduction on investment-type expen- ditures will only be offered for the next five years under the 2017 tax cuts. Second, raise your prices and save the ex- tra profits for the fu- ture, yours and your business'. e money can be used for your retirement, and a fair amount should be set aside as reserve funds for your business. If another recession hits your business, you will be glad you have the reserved funds, and your business will likely sustain while others around you will fall off the hay wagon like many did after the start of the 2008 recession. Remember, if you have no idea what to do, there are experts in our industry who do. ink about the theory and value of com- pounded interest. If you do it now rather than later, your investment will have the rest of your career to grow in value. | It is with that mindset that marketing remains an expense; whereas with the right plan, the money can be viewed as an invest- ment in the future, yours as well as your business'. And when the economy goes soft again—and it will—perhaps your business will be in the handful of known professional and steady businesses that it's safe and easy to do work with. INVEST IN MARKETING TO CAUSE DIFFERENTIATION If your business already has a good brand, I suggest you consider that brand doesn't matter outside the customers you have already served. In other words you may be a great artist, but what you can charge for your artwork will be limited because your art is only known and viewed by your custom- ers at their own homes. You need to make sure everyone in your market knows what makes your company great and different, regardless of whether they want or can afford to do business with you. Remember, when demand is high and homeowners are concerned, they won't even find a contractor to do their job and do it right. ey may have no choice but to pay your price, assuming of course you are willing to allow them to become customers. THE SUN WILL EVENTUALLY SET ON YOUR HAY FIELD History proves that every economic boom is eventually followed by a hard fall. It's more likely than not the economy will seriously challenge your business at least once before you retire. If you accept that as a fact, then now is the time to both invest and save. ake hay while the sun shines is an old proverb communicating good advice and something true. It simply means that you should take advantage of the chance to do something while conditions are good. Man, is this the time to make hay at your remodeling business. e conditions are not just good, they are great. And the conditions are expected to im- prove for at least the next few years. If you've wanted to grow your business into the go-to brand in your marketplace and a money-mak- ing machine, right now is the time to commit to making investments in your future and get the evolution started. 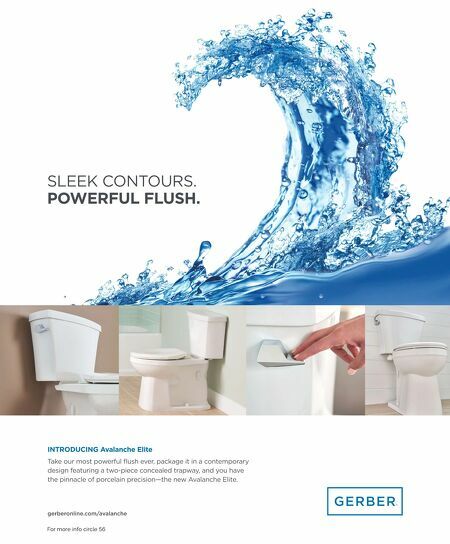 NOW MIGHT NOT BE HERE IN THE FUTURE e remodeling marketplace is booming. Dollars spent on remodeling are increasing. And the demand for contractors now exceeds availability in many markets. Remodeling customers and their projects are becoming a commodity, thus offering an opportunity for a limited number of qualified remodelers to raise their prices, perhaps dramatically. is moment also offers a great opportunity to pick and choose the right customers and jobs for your business—clients with the budget and the desire to afford what your business brings to the table. ESTABLISH A BRAND TODAY THAT WILL SUPPORT A SUSTAINABLE BUSINESS TOMORROW Every business has a brand, whether intention- al or not. Most remodeling contractors spend little to no money on marketing their busi- nesses. ose who do market don't even have a plan, nor are many interested in creating a written marketing strategy before they spend their investable dollars. In other words, they let their brand happen rather than deciding on and creating a brand intentionally. 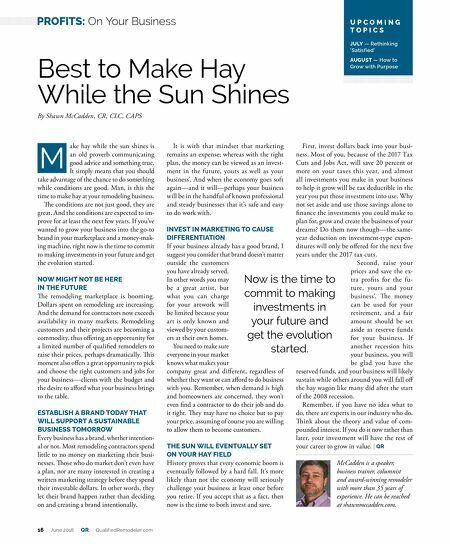 Best to Make Hay While the Sun Shines By Shawn McCadden, CR, CLC, CAPS U P C O M I N G T O P I C S JULY — Rethinking 'Satisfied' AUGUST — How to Grow with Purpose Now is the time to commit to making investments in your future and get the evolution started. M 16 June 2018 QR QualifiedRemodeler.com PROFITS: On Your Business McCadden is a speaker, business trainer, columnist and award-winning remodeler with more than 35 years of experience. He can be reached at shawnmccadden.com.